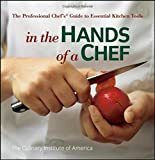 "This comprehensive overview of techniques associated with knives and other key kitchen tools truly benefits those concerned with preparing food safely and efficiently. . . . In the Hands of a Chef is an impressive guide, as important as the tools themselves." Founded in 1946, THE CULINARY INSTITUTE OF AMERICA is an independent, not-for-profit college offering bachelor's and associate degrees in culinary arts and baking and pastry arts. A network of more than 37,000 alumni in foodservice and hospitality has helped the CIA earn its reputation as the world's premier culinary college. Courses for foodservice professionals and food enthusiasts are offered at the college's main campus in Hyde Park, New York, and at The Culinary Institute of America at Greystone, in St. Helena, California. Greystone also offers baking and pastry, accelerated culinary arts, and wine certifications. Chapter 1. Knives and Cutting Tools. Knives for Butchering and Fabricating. Meat Pounder or Meat Tenderizers. What’s in Your Knife Kit?. Keeping Knives Clean and Sanitized. Slicing Cuts: Plain and Decorative. Decorative and Special Cutting Techniques. Chapter 3. Cutting Techniques for Vegetables and Fruits. Chapter 4. Cutting Techniques for Meat and Poultry. Carving Roasted Meats and Poultry. Chapter 5. Cutting Techniques for Fish and Shellfish. Preparing Live Lobster to Cook. Removing the Meat from a Cooked Lobster. Chapter 6. Hand Tools for Measuring, Mixing, and Baking. Converting Between U.S. And Metric Measurement Systems.